Preheat oven to 425ºF. Line a baking sheet with foil for easy clean up. Warm leftover spaghetti or cook fresh (sauce and noodles mixed together). Place the french bread halves onto baking sheet. Spread each piece with 2 Tablespoons of butter (more if you’d like). Sprinkle 1 tsp of garlic powder onto each piece. Bake in oven for 5 minutes or until golden brown. Remove from oven. 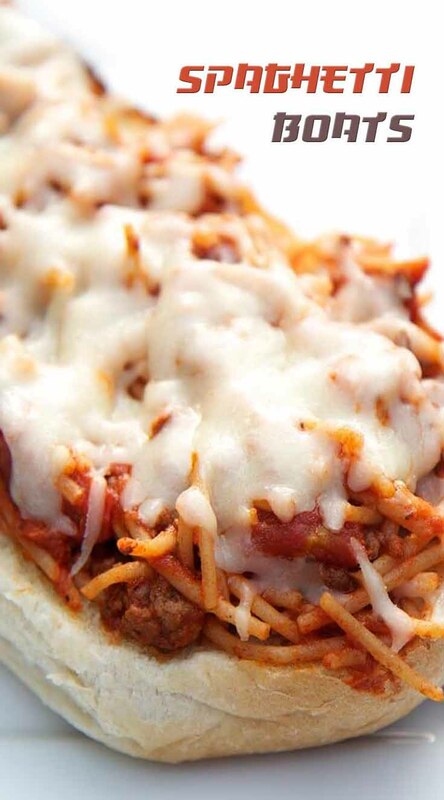 Top each piece of bread with about 1 cup of spaghetti. Then sprinkle on 1/2- 1 cup of mozzarella cheese. Bake for additional 5 minutes or until the cheese is nice and bubbly.